The old form of governance where the chief gathers around his subjects in a large kraal to discuss issues affecting his people, has similarities with government's imbizo progamme. Although the communities have grown larger and their needs and problems are different, government is using the traditional imbizo method successfully to attend to the needs of the people. The benefit of the imbizo programme is that government officials who visit the different communities serve as principals who check up on whether the local leaders are doing their jobs. If there are shortcomings, they are reported and corrected. During an imbizo meeting in October last year at Uitval in KwaZulu-Natal for example, the community told government representatives about councillors who did not call meetings or deliver services in their communities. The residents were told about their rights to elect and remove councillors who did not do their jobs. They were encouraged to use these rights when necessary. Government officials also visited Wembezi in Estcourt, KwaZulu-Natal. The visit was a blessing to Ntobeko Dlamini, a 17-year old girl who has the responsibility of looking after her family. Dlamini and her three siblings have been living alone in poverty since 1999 when their parents died. Thanks to the presidential imbizo, all the siblings soon got identity documents and they were helped with applications for child grants. 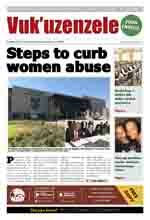 A widow, 40-year old Leah Phora, who survived on handouts, also benefited from an imbizo visit in her area. Her identity book was used to register her to receive a social grant and food parcels. Another widow, who lived in a very small house with her six children, benefited when she got help with her application for a bigger house. 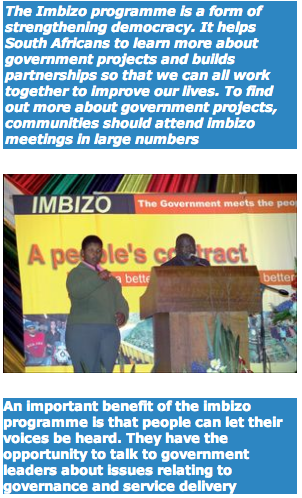 During izimbizo, people are also encouraged to get involved in activities like forming co-operatives to attract government's attention to their projects. Doing so will enable them to use funding opportunities made available by government instead of waiting for government to help them.